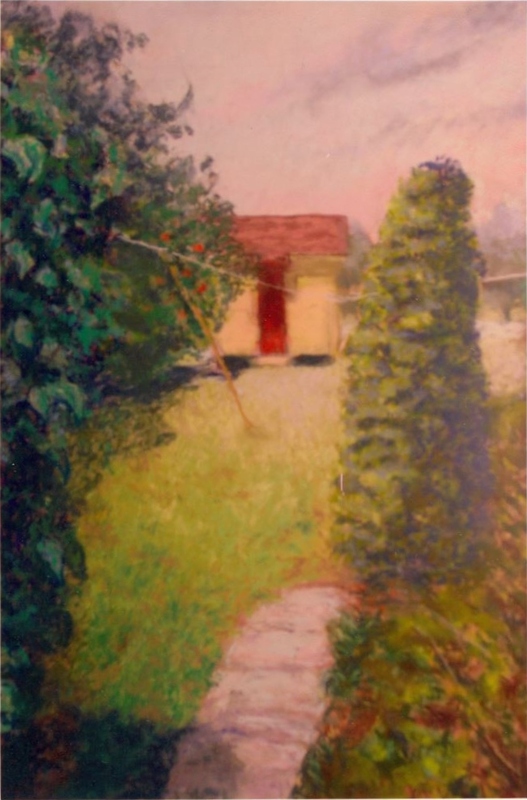 A painting by Bettye Reagan, a local artist in Central Florida, inspired by a photograph of the backyard of Paul Mikler, a history teacher and coach from Oviedo, Florida. Mikler was born on July 8, 1916, and was raised in Slavia, an unincorporated community that was once part of Oviedo. He taught at Oviedo High School (OHS), where he was seminal in shaping the school's baseball program, from 1946 to 1970. Mikler passed away on April 12, 2000. Original painting: Reagan, Bettye. Mikler Playhouse. 2003: Private Collection of Bettye Reagan. Digital reproduction of original painting: Reagan, Bettye. Mikler Playhouse. 2003. "Backyard of Paul Mikler." RICHES of Central Florida. https://richesmi.cah.ucf.edu/omeka2/items/show/6956. "Oral History of Paul Mikler." RICHES of Central Florida. https://richesmi.cah.ucf.edu/omeka2/items/show/5088. Rose, Shannon. "Mikler Created Legacy At Oviedo: Paul Mikler, Who Passed Away April 12, Was Dedicated To The High School And Its Sports Programs." The Orlando Sentinel, April 28, 2000. http://articles.orlandosentinel.com/2000-04-28/news/0004280290_1_mikler-oviedo-lessons. Reagan, Bettye Jean Aulin. 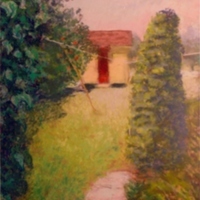 “Mikler Playhouse by Bettye Reagan.” RICHES of Central Florida accessed April 22, 2019, https://richesmi.cah.ucf.edu/omeka/items/show/6957.